Holy Bagel: It's Sunday afternoon, and I've got at least five more rooms to cover. Lunch, schmunchit's on with the show. 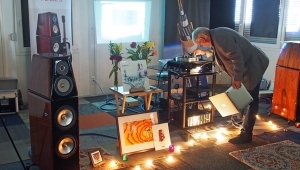 Although I wrote about a static display of Synergistic Research's latest iteration of their Tranquility Base, it wasn't until slow, slow Sunday that I could get into one of their packed listening rooms. 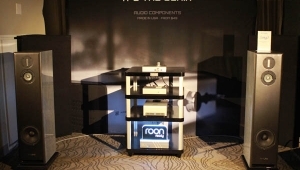 The wait was worth it, and the system was one of the best I encountered at RMAF 2016. Ted Denney and Scott Walker may have a penchant for big, big, barely manageable rooms that are valiantly wrestled into submissionbut in a much, much, much smaller space, everything really shone. At the head, Magico S3 loudspeakers ($22,600/pair), together with VAC Phi 170 IQ monoblocks ($9900/each) and Signature MKIIa SE preamp ($26,950), Berkeley Alpha DAC Ref. Series 2 w/Alpha USB module ($17,895) and MacMini. Under, around, underneath, and through, Synergistic Research PowerCell 12 UEF SE, Black Box, Atmosphere XL w/ATM, UEF Acoustic Panels, HFTs of three iterations, MiG 2.0 supports, Tranquility Base XL shelves, Grounding Block and Hi-Def Grounding Cable, and Galileo UEF (and otherwise) cabling. If I try to type out all the prices, I risk carpal tunnel syndrome. Did Ted really start out my listening with "Hotel California?" Oh yes he did. And boy, did it sound good. So did the ringing voice of tenor Juan Diego Florez, and the sweet violin of Joshua Bell (on the final movement of Sibelius' Violin Concerto). Ted does have a silly habit of cutting pieces short right in the middle of emotionally involving phrases, as though the music is only secondary to demonstrating what his out-of-the-box innovations can do. But when he asked whether I preferred to sit up close or farther back in the orchestra, and I responded with the former, his change of Atmosphere settings made a major difference in my listening perspective. Did I say that timbres were extremely natural? Bravo. I was all set to crown Crescendo HiFi with my Best Music of the Show award when I found Matt Alterman's musically adventurous mate in the form of Frank Schroeder. About time I met him! Ensconced in the Audio Union of MO room, this Co-Winner of the JVS Best DJ of RMAF 2016 Award segued from LPs of John Zorn's wild, wild Reckoning and Brooklyn Rider's far out Seven Steps to the Andrew Norman madness on my copy of Eighth Blackbird's latest CD, Hand Eye. Spaciousness was paramount, and the overall sound delicious, although I did note that some colors were slightly blanched out on the CD and all instruments except those in the high treble range had great body. All in all, a major winner of a system equipped to do full justice to out-of-the-box music that I much prefer to dreary ballet suites by Massenet and that other drivel that makes blue hair bluer. Frank was using his brand new Schroeder BA tonearm, an homage to broadcast gear designed for cartridges with low compliance ($2500 approx.). Since you can pre-order it now, he'd better decide the price pronto. It was one of two arms, the other being a Schroeder CB ($4000), on an HE-1 Helix 1 turntable ($40,000) with unidentified cartridge. 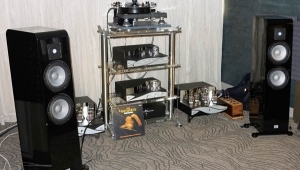 From Thrax Audio: Dionysos PRE-1 preamp ($19,500), Orpheus PH-1 tube preamp ($19,500), Teres AMP-H1 250Wpc hybrid monoblocks ($28,900, probably for the pair), and Lyra two-way stand-mounted loudspeaker ($19,500/pair). 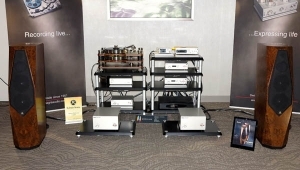 From CEC Audio: TL 3.0 CD transport ($32,000) and newly upgraded 5.0 DAC ($32,000). From EnKlein: Zephyr interconnects and speaker cabling plus Trex power cords. From me, Bravo and thank you. Thank you very, very much, Frank. Ah, how I like simple equipment lists from gifted designers. I also like good sound. Discussing the latter first, I experienced great beauty from a 24/192 file of Nat King Cole, warmth and soul on Nina Simone's magnificently understated "Happy Little Girl Blues," warmth and total fabulousness from Wes Montgomery, and a large soundstage and impressive speed from the Utah Symphony 75th Anniversary SACD that includes Andrew Norman's Switch. My elation was compromised solely by an overemphasized midrange and slight rolloff on top on the latter recording, which just happens to have been the only physical disc of the bunch. 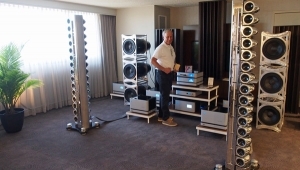 Heard: Oracle CD Transport ($11,000 Canadian), Bryston BDP-2 ($3300), Jeff Rowland Daemon Super 150Wpc integrated amplifier ($39,000), HRS RXR-1921-4V-M stands with 4RS-1921-B ($7,000 approx. 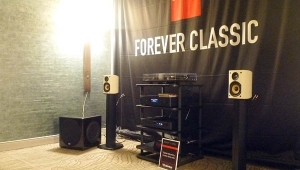 depending on exact configuration), Joseph Audio Profile speakers ($7000/pair), and Cardas Clear cabling. Eagerly anticipated: My return to this equipment. 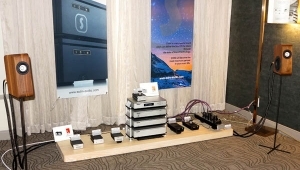 3Beez's flagship Wax Box 4 Special Edition music server ($6000), complete with the latest version of their patented Wax music management software, BitScrubber noise-eliminator Board and a whole lot more, joined PSB Imagine T2 Tower loudspeakers ($3498/pair), Benchmark Media Systems' rather ubiquitous DAC2 DX ($1,895), an AHB2 amplifier ($2,995), and unidentified cabling to deliver fine timbres, a nice sense of depth and space, but rather small-scale images. (It should be noted that the listening position was quite close to the speakers.) The Tacet recording of Handel's Concerto Grosso Op.6, No.2 had a fine midrange and extremely neutral timbres, but there was too much sharpness on top. Ditto for The Tallis Scholars' version of Allegri's Miserere. Given how much sounded right, I have a strong feeling that more space and different speakers would have made a difference. Thus goeth intuition. I didn't intentionally save one of the best for last, which made discovering how good this room from Vinnie Rossi and Fidelis AV sounded an extra treat. At its center was the combo of an everything and its mother but hold the slaw Vinnie Rossi LIO Integrated with DHT PRE linestage ($10,995 in but one of many of Vinnie's possible choose one from column A and two from column B), along with Vinnie's new VR Mini (Mini Pure-DC-4EVR) power supply ($795 until release date at November's end). 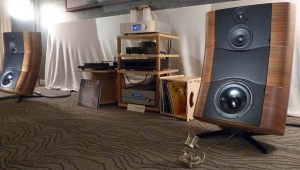 Then came Harbeth Super HL5 Plus loudspeakers ($6595/pair and up), which I like more and more with each hearing; an Acoustic Signature WOW XXL turntable ($3199) with their TA700 tonearm ($1199) and Ortofon Black cartridge ($775), and Tellurium Q Black Diamond Speaker Cables ($4200/3m pair). I'm sure there were interconnects, but they're not on the sheet. Missing as well were the four Stein Harmonizers in room corners that I am sure contributed to the fabulous three-dimensional soundstage, as well as the room treatment strategically placed around the room. Note that placement included a diagonal orientation, which prevented interference from a major standing wave that had a field day in the larger room. Norah Jones' "Painter Song" in 24/88.2 displayed beautiful Harbeth warmth and lovely colors. Christian McBride's "Little Sunflower" in 16/44.1 is a great audiophile track with all the bells and whistles, and the system seemed to do it full justice. Nor did it break a sweat when handed a 24/192 file of Stravinsky pulling out all the punches in his Rite. As for the LP set-up, we tried to listen to a 45 rpm of Richard Strauss's Also Sprach Zarathustra, but its 2001 beginning was MIA. I think what I heard was at the right speed, but it sounded way off. For files, however, this unquestionably warm but very right system was a winner. I'm eagerly awaiting release of MkII S3's, but not if it will require $70k of electronics to make them sing. I think a problem with component pairings at these shows is that one wants to make their piece shine, but if marrying it to overly-expensive mates is done to do so, those living within a budget will conclude 'great, but not for me'. Look specifically at sensitivity and the impedance curve. If a speaker's impedance curve is relatively flat, and does not dip too low in the lower midrange and bass, it will present an easier load to amplification than one whose curve rises and falls like a roller coaster. That will tell you what kind of amplification you need to make it sing. 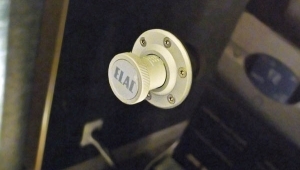 It will also indicate whether you can get away with a tube amp, or will need the extra grip of solid state. 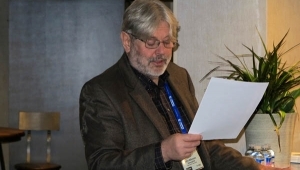 John Atkinson makes a point of discussing these matters in his measurement summaries. 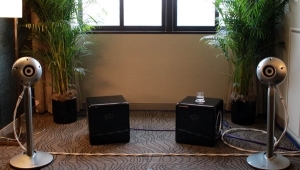 The conclusion you've reached about the conclusion "those living within a budget" will reach when they discover expensive speakers are only mated with expensive electronics and cabling may be true for you, but it is not necessarily true for people who understand the situation. 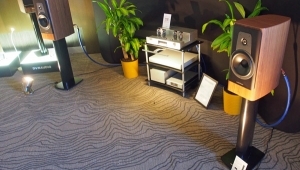 It is sensible that an exhibitor who believes in their equipment will want you to hear its full potential. 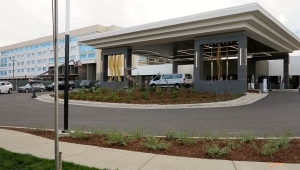 Most exhibitors know that full potential can only be revealed when every single component in the chain, including cabling and equipment racks, allows their equipment to shine. 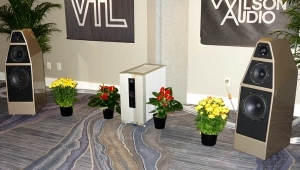 Conversely, exhibitors also know that since ultra-transparent electronics and cabling can reveal flaws, choosing companion electronics and cabling that softens the presentation and obscures minute detail will actually work in their favor. If you look at cable choices in a particular room, and know what that cabling sounds like, you can sometimes figure out who's trying to hide something. 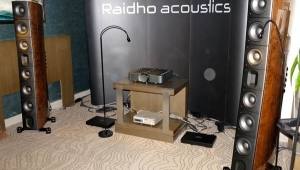 Nor is the opposite of what you discuss, that is, an exhibitor's decision to mate expensive gear with far less costly components in order to show how good their gear can sound no matter what it is paired with, always a good idea. 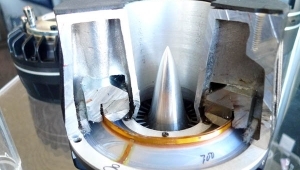 If you read through my blog, you will discover one situation - I think it was in the Aluminous room - where I speculated that the sound might have been better had higher level cabling been employed. Focal shined with less driving them. 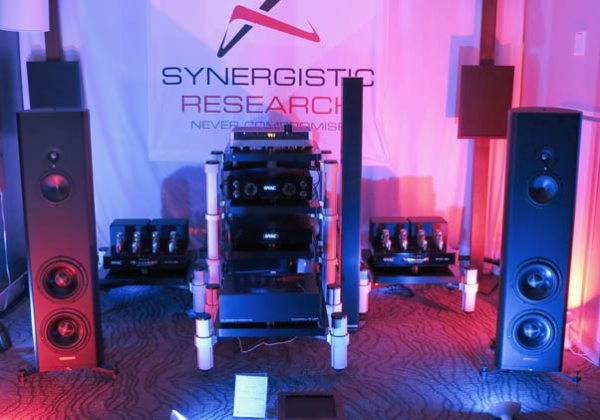 As a shopper/buyer of one and only one system for my home (a target audience of this show), I'd easily conclude that my $$ would be better spent on Focal vs Magico. I'm amazed that they were able to put a 99 lb. amplifier on the second highest slot in the HRS rack. How did they keep that whole rig from tipping over? HRS must put a bottom shelf of depleted Uranium on this equipment rack. That picture wins my RMAF gravity-defying, internet optical illusion for 2016 :) ! To tune the rack itself.